While there is a Qi-compatible AirPods Wireless Charging Case coming, it does not appear to be included with the default SKU of the AirPods for the foreseeable future —and the pricing of the peripheral is unknown. Phil Schiller said on stage during the Sept. 12 release event that the "optional new AirPods Wireless Charging Case" could be placed on the forthcoming AirPower charging dock. Little is actually known about the Apple's charging pad, or the AirPods accessory. AppleInsider staff examined both following the release event. The AirPods Wireless Charging case is functionally identical to the one that comes with the AirPods now, but with the green charging light on the exterior of the case instead of under the lid. The existing AirPods case has exposed metal on the back —which appears to be absent on the pre-release versions of the new case. 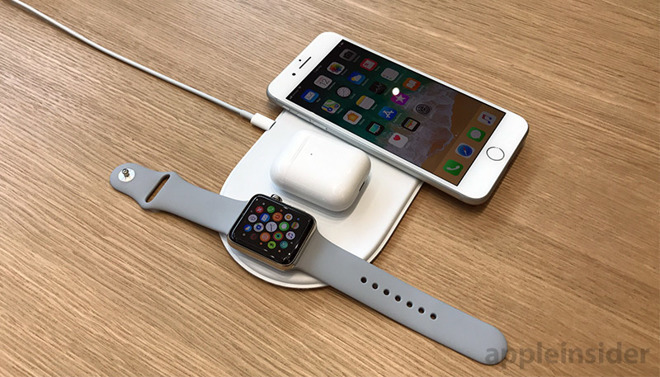 Beyond the AirPods Wireless Charging Case, the AirPower pad itself will enable wireless charging for the iPhone 8 and iPhone X, and the Series 3 Apple Watch. At this point, it is unclear if any combination of the three can be used on the pad, or how precisely the devices need to be placed on the pad. Not only is pricing on the AirPods Wireless Charging Case unknown, so is any specific availability date. Presumably the case will be available around the same time that Apple's AirPower pad is shipping —but should Apple decide to ship sooner, it would be compatible with an array of third party charging accessories available now. For comparison, Apple services venues currently charge $69 for a lost AirPods charging case. Also unclear is if the Qi spec that Apple has implemented will support beyond 7.5W. The Belkin Qi pad revealed on Tuesday is limited to 7.5W for one device, but the newest version of the Qi spec allows for 15W.